The technology of time travel is amazing, but not perfect. Sometimes I’ll type in a destination that I’m excited to visit and then I end up in some shithole. 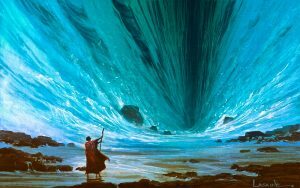 For instance, yesterday I wanted to visit the parting of the Red Sea, May 7th, 3:37PM, 1201 BC. I’d seen it a few times and it never gets old. But instead I ended up in some unknown place, 4.5 billion years ago, when the Earth was basically a newborn planet. Strange gasses filled the air and made it very hard to breathe, and there was a dearth of things to look at. Sure, I can’t stand buildings, and large groups of people, but it felt like the life was being sucked out of me by the utter nothingness in order to get something going. I struggled to get back to my time machine, barely making it. I zipped back home and slept two days straight. Then there was that time I wanted to visit Jesus’ Sermon on the Mount. I’m not necessarily a devote, but he was one of the most funny people I’ve ever met. I attended the Sermon at least seven times, and every time it’s hilarious. The text was in the earlier versions of the Bible, but churches found people were showing up to church for the Sunday sermons to enjoy a good laugh and left disappointed because, I’m telling you, no one was ever as funny as Jesus. So the church took the jokes out the Bible. I have a copy of the earlier funny version if you want to borrow it. Anyway, I thought I was going to the Sermon, and the time time travel machine mistakenly took me to Judea, the year 12, and the induction ceremony for the new Prefect, Annius Rufu. Words were spoken in barely audible tones, there was little or no movement, it must have been 120 degrees, and it lasted 7 hours. I stayed because I was taught it was bad manners to leave when something was unpleasant.